About values-based leadership with soul and purpose, about personal growth and development, about the connectedness of all things. We grew up in an era dominated by individualism and competition. These human traits have driven the accumulation of wealth, power and technological advancement and taken the world to a place where we stare into an abyss of global inequality and conflict. Many decisions are still being made on the assumption that it is human nature to be narrowly selfish. Yet a bigger picture, going right back to the original roots of our species Homo sapiens in Africa, reveals just how much we are hard-wired for both collaboration and competition. 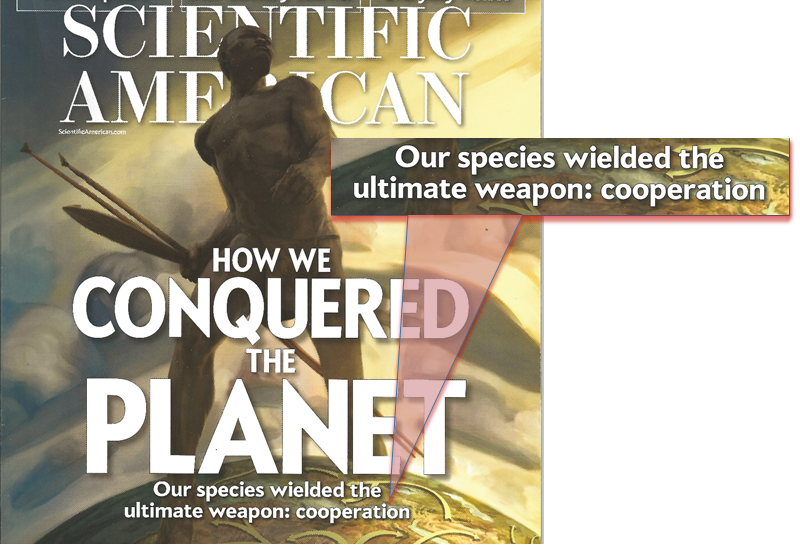 As this month’s Scientific American cover story highlights, there is direct evidence that Homo sapiens’ success in colonising the earth, moving out of Africa from about 70,000 years ago, depended on our ability to collaborate beyond kinship groups. Our early ancestors here in South Africa found good reason to shift from individualistic hunter-gatherer mode: during tough climatic conditions about 100,000 years ago they banded together to defend rich shellfish deposits along the southern coast – and as we know, eating these “brain foods” in turn supported their development. An international research team linked to the Nelson Mandela Metropolitan University provide a strong case that it was those early humans who were able to collaborate in this way who survived. Only by banding together were they able to make the most of this unusually rich source of food. 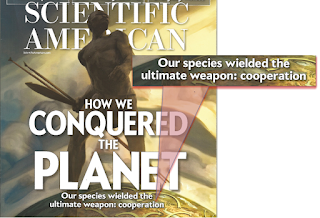 Once they added projectile weapon technology to their collaboration breakthrough, our ancestors were successful in their rapid expansion out of Africa to colonise the world. Why is this important? Because many people and organisations are so strongly influenced in behaviour, policy and decision making by the theory that humans are rational and narrowly self-interested. This idea must die, says Stanford University’s Professor Margaret Levi: “The overwhelming finding of experimental research confounds the presumption that, given the opportunity, individuals usually free ride. Indeed, most act according to norms of fairness and reciprocity. Many will make small sacrifices or forego larger returns, and some will even engage in costly action (up to a point) to "do the right thing." In the workplace, give up the model of a single dominant leader commanding and controlling subordinates, and actively develop collaborative, innovative teams. This is not just a warm fuzzy nicey-nice approach. What is rooted in our ancestral strategy for success is that both relationship and results are important. We ignore either one of these at our peril. (c) Copyright 2010-2012 Mish Middelmann - Coaching Enterprising People. Simple theme. Powered by Blogger.